The emperor receiving a candidate during the Palace Examination. Song Dynasty. 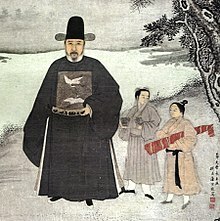 A 15th-century portrait of the Ming official Jiang Shunfu, now in the Nanjing Museum. The decoration of two cranes on his chest is a "rank badge" that indicate he was a civil official of the first rank. "Cribbing Garment" worn as underwear into the examination. Examination hall with 7500 cells, มณฑลกวางตุ้ง, 1873. ↑ 3.0 3.1 หนังสือพลิกม่านไม้ไผ่ โดย ประสิทธิ์ ฉกาจธรรม, บก. ↑ Wolfgang Franke, The Reform and Abolition of the Traditional China Examination System (Cambridge, Massachusetts: East Asian Research Center, 1968) : 70-71. ↑ Nicola Di Cosmo (2009). Military culture in imperial China. Harvard University Press. p. 245. ISBN 0-674-03109-1. สืบค้นเมื่อ 2010-06-28. ↑ Susan Naquin, Evelyn Sakakida Rawski (1989). +musicians, +actors, +and+some+yamen+employees+ (gate+keepers&hl=en&ei=LEi4TvXkM8rL0QHX18XSBw&sa=X&oi=book_result&ct=result&resnum=1&ved=0CC0Q6AEwAA#v=onepage&q=The%20latter%20category%20included%20remnants%20of%20aboriginal%20groups%20who%20had%20survived%20Chinese%20expansion%20and%20settlement%20and%20practitioners%20of%20occupations%20that%20included%20prostitutes%2C%20musicians%2C%20actors%2C%20and%20some%20yamen%20employees%20 (gate%20keepers&f=false Chinese Society in the Eighteenth Century Check |url= value (help) (reprint, ed.). Yale University Press. p. 117. ISBN 0-300-04602-2. สืบค้นเมื่อ 2011-10-31. ↑ Samuel Wells Williams (1883). The Middle kingdom: a survey of the ... Chinese empire and its inhabitants ... (revised ed.). New York: Wiley & Putnam. pp. 321, 412. สืบค้นเมื่อ 2011-05-08. ↑ Ssu-yu Teng, "Chinese Influence on the Western Examination System", Harvard Journal of Asiatic Studies 7 (1942-1943) : 267-312. Thomas H.C. Lee, Government Education and Examinations in Sung [Song] China (Hong Kong: Chinese University Press, ; New York: St. Martin's Press, 1985). Yang, C. K. [Yang Ch'ing-k'un]. Religion in Chinese Society : A Study of Contemporary Social Functions of Religion and Some of Their Historical Factors (1967 ). Berkeley and Los Angeles: University of California Press. Étienne Zi. Pratique Des Examens Militaires En Chine. (Shanghai, Varietes Sinologiques. No. 9, 1896). University of Oregon Libraries (not searchable), American Libraries Internet Archive Google Book (Searchable). This article incorporates material from the หอสมุดรัฐสภา that is believed to be in the public domain. หน้านี้แก้ไขล่าสุดเมื่อวันที่ 4 กุมภาพันธ์ 2562 เวลา 19:05 น.